Captain D’s is a chain of restaurants in the “fast-casual” category, which specializes in fish and chips and other seafood products. This is a United States based chain of restaurants, found across the country. Their parent company is Centre Partners. For more information on your Captain D’s application, follow the link below. Founded in August 1965 in Donelson, Tennessee by Ray Danner, the restaurants were originally named “Mr. D’s”. 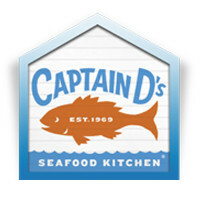 In 1974, the name was changed to “Captain D’s Seafood” in order to show their focus towards seafood products. They are most known for their fish and chips, as well as their shrimp and some classic sides. Currently headquartered out of Nashville, Tennessee, they have over 500 locations across the United States. After going into bankruptcy and being purchased by their current parent company, they found a surge of interest in opening franchises for this company. This incredible turnaround has earned this company the 2013 Turnaround Deal of the Year award. This is a company that has a huge focus on providing great quality seafood at an incredible price. They are looking for employees that excel in interpersonal skills in order to provide the highest quality of customer service to their customers. Captain D’s wants each customer to have a positive experience in order to keep them coming back for more. Captain D’s provides a variety of positions for those job seekers looking for something that is a good fit for them at both the corporate office and restaurants. The restaurants provide entry-level positions so that a person can turn their job into a Captain D’s career and allows for growth within the company. Some restaurant positions include server, line cook, and manager. The corporate office has a wide variety of positions that anyone can find something that is a fit for their skills and talents. While the corporate office does have some entry-level positions, most positions are higher level positions with more requirements to gain employment. Some corporate level jobs include marketing, human resources, and legal. The different positions at this company have different sets of requirements in order to gain employment. Entry-level positions may not have any education or experience required to work here. Higher level positions may require a college degree and several years of experience. How old do you have to be to work at Captain D’s? The minimum age of employment is 16 years of age. Captain D’s provides competitive benefits for their industry. Employee eligibility for benefits can depend on hours worked weekly and job title. Some benefits include health, accident, life, and dental insurances. They may also include employee discounts, paid time off, and a 401(k) package. Other benefits include child-care and healthcare tax advantage savings accounts. The hours of operation can vary depending on location and holidays. During some holidays, restaurants may be closed all day or half day. For more information, check your local restaurant for details on their hours. In general, hours of operation are Sunday through Thursday from 10:30am to 10:00pm and on Friday and Saturday from 10:30am to 11:00pm. Guest Specialist- The guest specialist is the catch-all name for all of the kitchen and counter staff at the restaurant. They are responsible for taking customer orders in the drive-thru window or the counter. They are also responsible for putting together the order according to the customer’s wishes. They will be responsible for preparing and cooking the food as well as handling customer transactions. Guest specialists may earn the minimum hourly wage. Assistant Manager- An assistant manager is responsible for assisting the restaurant and general manager in running the daily operations of the restaurant. They will train new employees and perform many of the same responsibilities as the guest specialist, and fill in wherever needed when they are short-staffed or busy. An assistant manager may earn around $10 per hour. Restaurant Manager- The restaurant manager will help the general manager in running the daily operations of the restaurant. They will assist in performing employee reviews and help train new employees. They will also assist in ensuring inventory is properly stocked, as well as maximizing sales at their location. A restaurant manager may earn around $30,000 a year. General Manager- A general manager is responsible for running the daily operations of the restaurant. They will hire and fire employees as needed. They will conduct job interviews for potential candidates. A general manager will also be responsible for their restaurant’s payroll and budget, as well as scheduling staff in the most cost-effective manner possible. A general manager may earn around $45,000 a year. Why do you want to work at Captain D’s? This question may require some research prior to your interview. The interviewer is looking to see what you know about the company and what they stand for. Answer honestly, describing which values that you feel you share with this company and why that makes you a good fit to work here. Why should we choose you over the other applicants? The interviewer is giving you the chance to sell yourself to the company as the best applicant for the job. Take this chance to describe your strengths and why you feel the company would best benefit from them. Try to do so without sounding too boastful. Do you have any previous customer service experience? Some higher level positions may require previous experience in this field. Customer service is hugely important to this company, and they want their customers to get the best service. Answer honestly about any previous experience. How important is working as a team to success? This is a company that requires their staff to pull together and work as a team is important to the operations running smoothly. The interviewer is asking this question to see how well you can work as a team. Mention any time that you have had to work as a team to accomplish a goal. Are you a people person? This company relies on their staff to make their customer’s experience in their restaurant a positive one. The interviewer wants to ensure that you have the skills required to deal with any and all types of people. Answer honestly, mentioning about your patience level and need to please the customer. Wondering how to apply at Captain D’s? You can apply for a Captain D’s job by visiting Captain D’s jobs online. From there, you can apply for a restaurant level job directly online, or send in a resume to the email address listed for a corporate position. You may also fill out an application form at your local Captain D’s. The company website has a brief mention of job descriptions of positions within their company for potential job seekers to find a position that is a good fit for their skills and talents. You should only apply for a position that you are qualified for. Remember to fill out your application completely and according to instructions provided. You should submit an updated resume along with your application. After applying at this company, you should hear back within a reasonable amount of time. If not, you can contact the location that you applied at to check the status of your application or to see if they are still hiring for that position. They may also inform you of when interviews are set to begin. You may want to consider preparing for your interview beforehand. You are able to do this by asking yourself potential interview questions and answering them aloud. This will help you be less nervous for your interview, which will help you seem more confident and articulate. Remember to dress in a professional manner. This can help increase your chances of getting the job. Schlotzsky’s: For career opportunities, fill out the Schlotzsky’s online application. Cousins Subs: For employment at Cousins Subs visit the application page. Church’s Chicken: Visit the job application for Church’s Chicken to apply today. Hardee’s: Hardee’s offers opportunities for both, beginners and experienced roles. Firehouse Subs: For career opportunities, fill out the Firehouse Subs online application.